All walk behind scrubbers are not created equal! 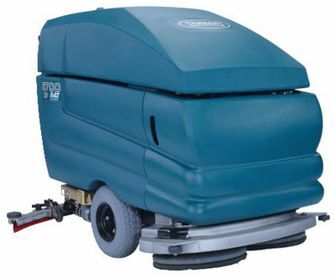 No matter the floor surface or cleaning environment the Tennant 5700 gets the job done. This machine is available in both a disk or cylindrical styled scrub head. The disk head is great for scrubbing, buffing and polishing smooth floors that have minimal debris. The cylindrical brush scrub head is designed for floors with debris, it picks up small debris while scrubbing to eliminate squeegee clogging, leaving you with a streak-free floor. The 5700 comes equipped with easy to read gauges as well as simple electrical controls. Note: There is an updated version of the Tennant 5700, now called the Tennant T600/T600e. The 5700 also comes in an upgraded version called the Tennant 5700 XP. The XP automates functions with electronics that are presettable in order to match your floor conditions. This allows for the machine to be preset, leaving the operator with only one button to press. The (now retired) Tennant 5700 quickly became the #1 selling machine in industrial applications because it could handle tough environments and last for 10+ years. Experienced cleaning professionals knew that these machines are the best long term value in the industry. They also have, by far, the highest resale value of any walk behind scrubber. The 5700 uses heavy aluminum castings for the scrub deck and squeegees where others use painted steel. The rotationally molded tanks are made from almost indestructible polyethylene and carry an 8 year warranty. Even the frame is made from a composite material that cannot rust. The bottom line is that you will always be able to work on your Tennant 5700 without fighting corroded parts and hardware. The electrical system of the Tennant 5700 Scrubber is far better than most of its competitors. Wrapping the wires in Kevlar and using water tight, triple seal electrical connectors make this scrubber extremely reliable even in harsh, damp environments. Unfortunately, many competitive units cannot make these claims and begin to have electrical issues very early on. It is simply the most reliable, heavy duty scrubber ever made. Parts and service support for this unit is by far the best of any scrubber on the market. It has the longest life expectancy of any walk behind scrubber available. Resale values for this unit are about double compared to their competition. Units are available in three different scrub paths - 28", 32", or 36"